A heavy looking stone fireplace can really weigh down a room...especially if you want a light, airy look. Adding a white mantel http://www.brick-anew.com/fireplace-mantel-shelves.html or a light colored rustic mantel http://www.pearlmantels.com/shelves2.html to lighten things up. I love this picture by Better Homes and Gardens. 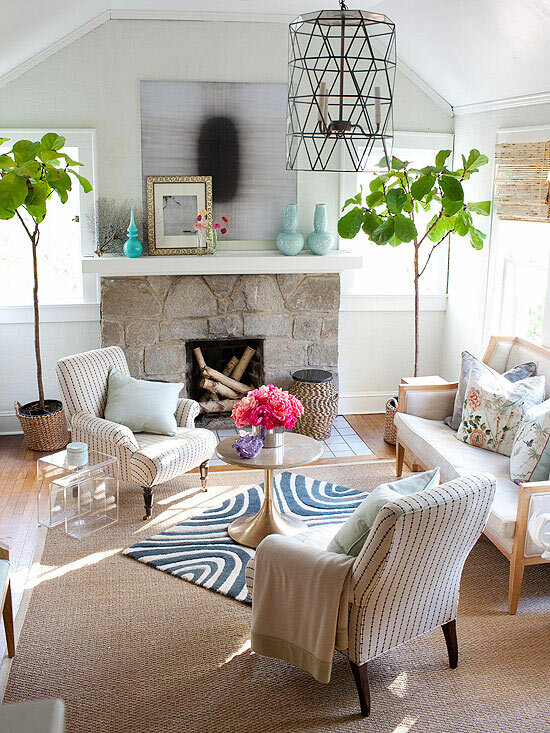 Notice how the acrylic accent table and the light blue vases give a modern look. Bring in some nature with a couple of green trees and fresh flowers add a pop of color. Stack some firewood in the firebox to add interest and you've got a rustic fireplace with a modern flair! What ideas do you have for keeping a room from being weighed down by a heavy looking stone fireplace?